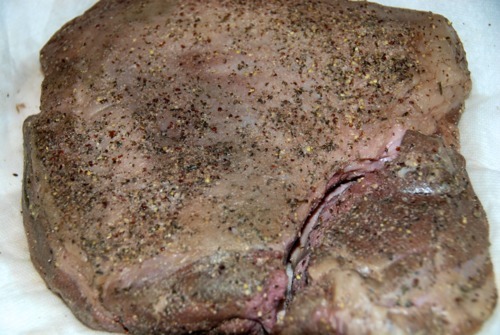 Remember how I sous vided a butterflied lamb leg and tri-tip roast earlier this week? Well, I finished cooking off the lamb tonight and it was fantastic! 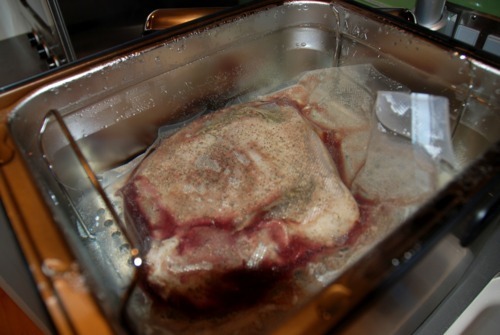 Remove the cooked meat from SousVide Supreme and plunge in an ice water bath for 1 hour and store in fridge or freezer until needed. 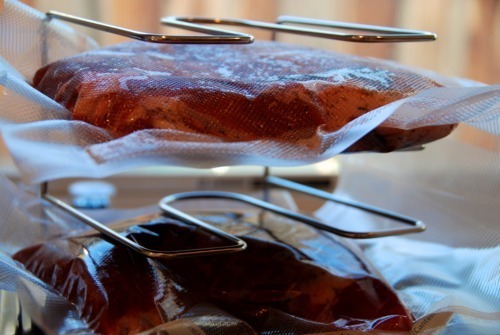 If reheating from fridge, set SousVide Supreme to 130F and drop in packet for 30 minutes. Then, remove the packet from the bath and pat dry with paper towels. 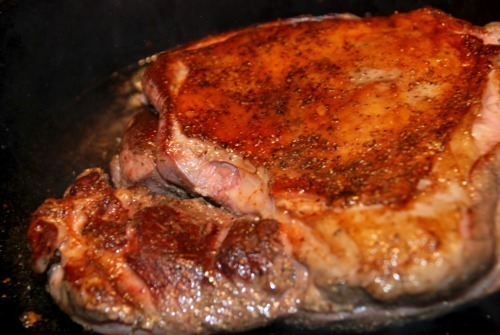 Heat up 2 tablespoon of lard in a cast iron skillet on high. Sear the leg, fat side down when fat is smoking. Leave undisturbed for 2 minutes. 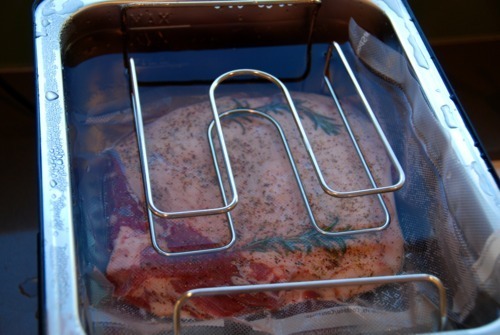 Flip over and sear on the other side for 2 minutes. Slice up and dig in! Really delicious! 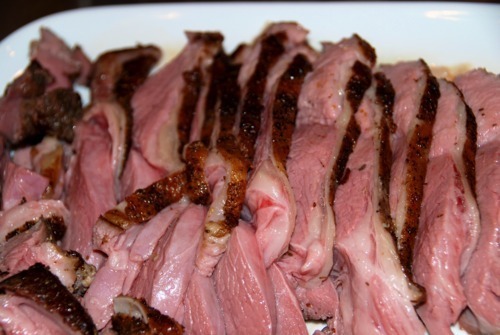 In the past, when I’ve roasted boneless leg of lamb the conventional way, parts of it would be too rare and other parts would be too well-done. This piece of meat was pink throughout and really tender and juicy. Plus, it was seasoned really well. 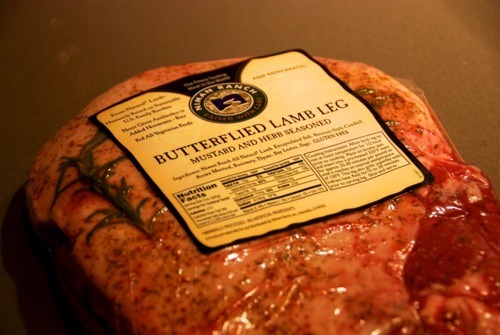 I’d definitely plunk down $20 plus change for this pre-seasoned, ready-to-cook piece of lamb. There’s definitely enough meat for 6 hearty eaters. Next to pork chops, this was the best thing I’ve made in my SousVide Supreme thus far. 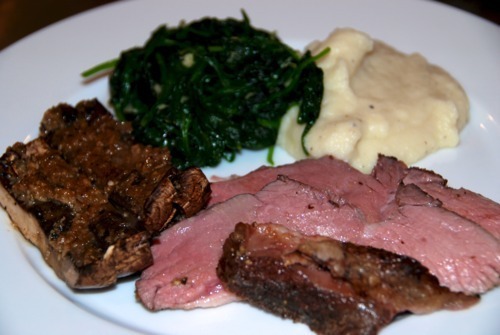 I served the sliced lamb leg with garlic cauliflower mashed “potatoes”, and sautéed spinach. Nom. nom. nom.